"Sarah will work in the House for you." When I left the Supreme Court, I didn't know if I had won or lost the case. I went back to Austin and waited for the decision. 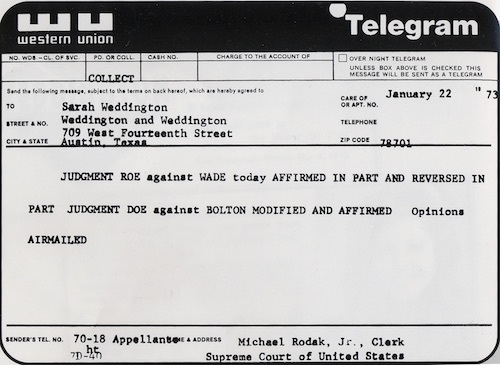 On January 22, 1973 I learned that the Supreme Court had agreed with my position by a vote of 7-2. Here is the telegram I received that day. As you can see, it was sent "collect." If anyone had asked me if the significance of this 1973 decision would still be so important many years later, I would have said "No." I would have been wrong. The early seventies was a time when women were lobbying elected officials to respond to their issues and when new efforts were being made to elect women to public office. In Texas, Sarah Weddington and some of her friends began an effort that resulted in her becoming the first woman elected to represent Austin-Travis County. The campaign and election allowed Weddington to assume a leading role in responding to women's issues within the legislative process. • The credit policies applied to Texas women were ridiculous. Even those women who had their own money or earnings were often told they had to get a man's signature (their father's or their husband's) to get credit. That made no sense to us. • Public school teachers who became pregnant were expected to resign; if they didn't they were usually fired when the pregnancy became obvious. We thought teachers could walk, talk, teach and be pregnant at the same time, and that they shouldn't be forced to quit. • Abortion was illegal in Texas except to "save the life" of the woman, but doctors were unsure what that meant and were unwilling to perform abortions at all for fear they would be prosecuted. We thought Roe v. Wade might change that law, but we didn't know if the U.S. Supreme Court case would go our way. There were many other laws that needed to be repealed, and new laws needed to be passed to change these and other "wrongs." Using traditional avenues, we lobbied the members of the Texas Legislature during the 1971 spring session and became quite frustrated with the glacial pace of change. We were also upset that we couldn't get appointments with most legislators; they weren't willing to sponsor the legislation that we felt was important. In general, they were so skillful at ignoring us that we felt all but invisible at the Capitol However women's groups had an important victory that session. The legislature voted to put an equal legal rights amendment to the Texas Constitution before Texas voters; it would be on the November 1972 ballot. We felt that far more victories like this one would be possible if women were elected and on the floor of the House. Change was in the air in Texas politics during that fall of 1971. Eighteen year-olds had just gotten the vote, and that was especially important in a college town like Austin. There had also been a recent scandal in Texas politics: several state officials were accused of accepting bribes to pass a bill that would favor the owner of a bank in Sharpstown. Voters were disgusted with the people in office, and those accused in the Sharpstown scandal were all white males. New ethics legislation was a major topic of conversation, and there was increasing talk of organizing support for women and minority men to run for office. In Austin, there was an open seat in the legislature, an incumbent legislator had decided to run for statewide office instead of reelection. The seat in that district was an at-large seat, so voters from the entire county (Travis, with a population of about 350,000) where Austin was located were eligible to vote. My friends and I began to discuss the benefits of having a candidate for that position who would work for the issues we cared about. We discussed the need for more champions and favorable votes in the state legislature, and we agreed that the best way to direct attention to the broad spectrum of issues of special interest to women was through the election of women to the Texas Senate and House of Representatives. My friends and I had recently been involved with others in forming women's political caucuses nationally and in Texas, and our determination to change things was fostered by the sense of shared political goals. We felt connected to a groundswell of activity to elect women that was occurring nationwide, and we were tired of begging male legislators for help. Оne evening a group had dinner at my house, and the discussion continued until we agreed on the following items: the only way for women's issues to be addressed was for women to hold elected office, the only way for women to hold elected office was for women to run and to win, and the only way to train women to help elect women was to run campaigns and to "learn by doing." Most men, we agreed, were skeptical of women's ability to win and generally would not devote time, energy or money to women candidates. Our task, we agreed, was to find a woman candidate and run a campaign. Together we would learn how to win for women. All of us were in our twenties. Most had prior experience as receptionists, secretaries or assistants to male politicians, but none of us had actually been in charge of a campaign or held a major responsibility in a campaign. We really didn't expect to win our first campaign together, but we decided that making the effort was a priority for all of us. The only thing we lacked was a candidate. We finally agreed that one of us had to do it; several in the group would have been terrific elected officials. But eventually the group decision was that I would be the candidate: I was the only one with a law degree, the traditional preparation for men in politics. The house where my husband and I lived and worked was large enough to serve as campaign headquarters, and I was willing to pay the $100 filing fee from my savings. I also had extensive knowledge of the legislative process since I had been a clerk and typist for the Texas Legislature in 1965 and had spent every spare moment watching the House in action and learning how it operated. Now I look back and chuckle at our lack of sophistication. We never ran a poll to see if I could win, but if we had, the results probably would have been discouraging. We never talked to city leaders to see whether they would encourage me to run; no doubt their response would have been the opposite. In a youthful burst of enthusiasm, we decided it was important to try, and we were willing to give time and effort to do that. I officially announced my candidacy for the Texas House on February 7, 1972. Three men signed up to run for the same seat in the Democratic primary. 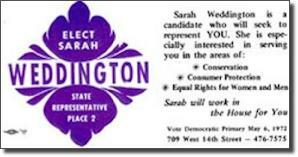 My campaign slogan was "Sarah will work in the House for you." A volunteer designed our logo: the words Elect Sarah Weddington State Representative Place 2" in purple and white, colors no one else had ever used, and in the shape of a flower. Our yard signs were nearly impossible to read from a passing car but once people knew what that purple-and-white flower symbolized they did not need to read it. The demands of a low-budget, grass-roots campaign were endless. Our first task was to reach out and find volunteers who were willing to help us. We held an open house at campaign headquarters. We collected names and addresses of people willing to display my signs in their yards. We solicited names of people who were willing to have get-togethers in their homes where I could meet their friends and neighbors and discuss why I was motivated to run. My husband painted signs to mount on top of cars as "moving advertisements" for my campaign. We sought endorsements from important groups and people in local politics, and the growing number of volunteers celebrated with each new name. Money was a constant worry. The group had agreed never to spend money we didn't have. We made most of our money through five dollar home-made chill suppers, with the volunteers cooking and bringing in the chill. We waged a very low-cost campaign, but we managed to get a few spots on TV. Because there was little money to spend, the ingenuity of the volunteers was extremely important for the campaign's visibility. For example, Ann Richards, who later became governor of Texas, was a volunteer with marvelous ideas, such as her idea for a Democratic fair, which included food, music, speeches and a chance for voters to meet the candidates. Each candidate would sponsor a booth where voters could come to meet them and from which they would vie for attention. My campaign workers had heard that other better funded candidates would be handing out personalized emery boards, balloons with their pictures on them and other paraphernalia that we couldn't afford. Ann came up with the idea of putting my bumperstickers on cheap white paper sacks. What I did was sit and autograph the sacks and hand them out for people to put all those other candidate give-aways in and keep the environment clean. So, what people saw at the fair were lots of people carrying Sarah Weddington sacks. It was a great success. Оur campaign was poor, but personalized. We went from door to door in neighborhoods asking to speak to anyone of voting age. I passed out brochures in front of cafeterias, on downtown streets, and anywhere we found a crowd. It was hard to hand a brochure to a stranger only to see the person walk a few steps and toss it on the ground, as often happened. But other people seemed interested and offered a smile and kind words. The Democratic primary was held on May 6, 1972. I made it into a runoff. Our campaign celebrated briefly, then tried to map out our strategy. My male opponent was from an old Austin family and would be able to raise far more money than I. However, he was having trouble running against a woman. He would not call me by name, generally referring to me as "that sweet little girl." His condescending attitude made me mad–and luckily it had the same effect on many other women voters. He was the odds-on favorite, but I had a chance to come from behind. Then my opponent made my appearance a campaign issue. He claimed I wore my hair long on the university campus but put it in a bun for business groups. That he said, was done purposefully "to confuse the voters." "People seemed to think that was a ridiculous thing to give as a reason to vote for him rather than me. Next, he began to allege that he was a life-long resident of Austin but that I was a transient." It was true that I moved to Austin in 1965 to work for the legislature and then attend law school and after graduation decided to make Austin my home, but a large number of Austin residents had also come to pursue an education and then decided to stay. I believe I got lots of votes from other "transients"—like myself. We redoubled our efforts to meet as many voters and shake as many hands as possible. I walked through state office buildings and shook the hand of every worker I could find, simultaneously offering literature and asking for their support. My volunteers fanned out over Austin to leave my brochures in every women's restroom in town, often taped to the mirrors. We went anywhere there was a crowd. Volunteers continued to come up with unique, low-cost ideas. One was to use a new service of home-delivered advertising to get my literature out to more homes than we could reach on foot. As the July 3 primary runoff approached, we worked for endorsements from every group and important individual we could think of. We printed postcards for people to mail to their friends and acquaintances asking them to vote for me. We had a special strategy for that Saturday election day with volunteers at every polling place to remind voters of my candidacy. I voted early then hit the pavement looking for people I could remind to vote and convince to vote for me. At seven that night as the polls closed, I returned to headquarters to join campaign volunteers awaiting the results. The phones started ringing an hour later. The early returns looked good. During the next hour, my opponent conceded. I had won!! I still had to win the November election against a Republican candidate, but we expected a victory in that general election. The difficult race was behind me. And it sweetened the victory of the Democratic primary when I heard that my opponent was being ribbed and given grief about how in the world he could spend so much more money (than I did) and still be beaten by that sweet little girl. The general election was Tuesday, November 7, 1972. I won by a large margin. Volunteers and workers filled campaign headquarters and we celebrated what a group of dedicated women could do when they were brought together by strong, shared values. We also celebrated the fact that we managed to win the election while spending only $17,000 including the runoff, and the campaign was entirely debt-free on election day. When the legislature convened in January 1973, I became the first woman to represent Travis County in the Texas House of Representatives. There were 76 newly-elected members of the House, a majority of the 150 members. There were now five women members, more women held seats in the Texas House that session than ever before. The number of minority men in the body had increased dramatically also. I ran for reelection in 1974 and 1976, but those election races were easy victories. I had been true to what I pledged to the voters I would do, and they overwhelmingly returned me to office until I resigned the seat to go to Washington, D.C. and work for President Jimmy Carter.